Flowers and snacks were piled up outside the charred three-story Gukil Gosiwon building, Monday, in a silent memorial to seven tenants who died in a fire there. 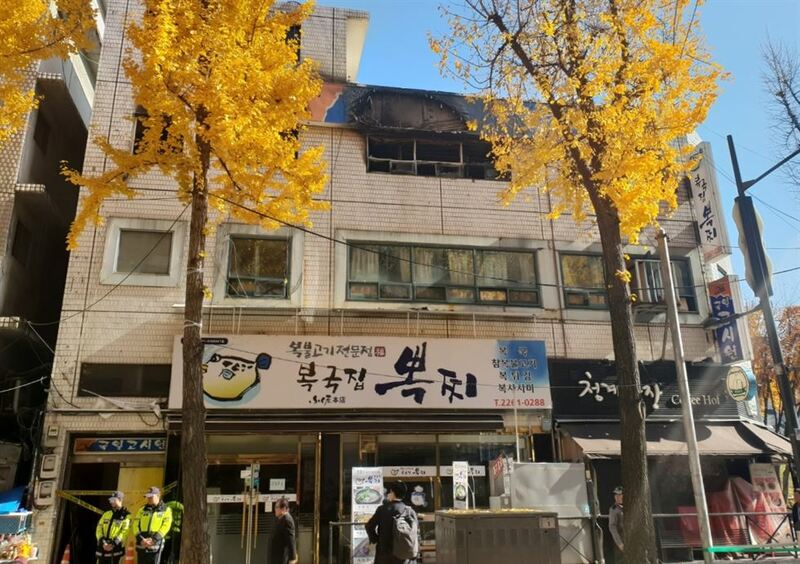 The fire at the gosiwon (a low-cost single-room type of accommodation) in central Seoul once again reminded people of the unsafe living conditions facing most of its destitute residents. Fire hazards are common in these makeshift housing facilities. Inside, tiny rooms line both sides of a narrow dim corridor. Kitchens and bathrooms are shared facilities and each room is only three to four square-meters in area, barely enough space for a person to stretch their legs. Many do not even have windows. Gukil Gosiwon, like many others, had only one main exit and no sprinkler system. "People should not have to live in such cages," Yun Sung-no, a member of the Korea Union of Tenants, told The Korea Times outside the building, Monday. Yun said one of the survivors of the fire moved to another gosiwon right in front of his former one. "Can you imagine how traumatic that is?" he asked as he pointed to the third floor of another commercial building directly facing the soot-covered windows of Gukil Gosiwon. There are around 5,800 gosiwon in Seoul. The name comes from the Korean word gosi, a state examination to become a public servant — a secure and coveted job in Korea — as these medium-term housing facilities first appeared to host budget-tight students who want to live near their preparation academies. The victims on Friday, however, were not young exam-takers but day laborers in their 50s to 70s, one of the most destitute demographics in the slowing Korean economy. "This is where the people holding up the bottom tier of Seoul's economy live," Yun said. "Unlike the outskirts where there is government-subsidized housing, you can find work here, and also save on transportation costs." The area, close to Euljiro, one of the industrial hearts of Seoul, has numerous small-scale factories and job agencies. A nearby soup kitchen also serves free meals. The gosiwon are sometimes referred to as the last remaining shelters for Seoul's poor, as those who cannot afford to pay the monthly rent are inevitably pushed onto the streets. The monthly fee for a room at a gosiwon in downtown Seoul is around 350,000 won, and no deposit is required. It nevertheless is a hefty sum for day laborers who make around 1.2 million won a month. Around 370,000 people live in gosiwon and other similar housing facilities nationwide — jjokbang (slum-like villages) and long-lease motels — according to 2016 data from the Ministry of Land, Infrastructure and Transport. The Seoul Metropolitan Government announced Sunday it would check on the fire safety of the city's gosiwon and other similar housing facilities. "The city should not just stop at looking for fire hazards. They have to study the economic situation of gosiwon residents to see how they ended up there in the first place," Yun said, "so they can provide these people with financial counseling and better housing options."